Back when I first participated in the Kino Kickstarter for the Pioneers of African-American Cinema, I just dipped my toes in the water. My hope was just to get one Blu-ray for a decent contribution and support a great project in the process. As the days passed and their participation increased, I became more wrapped up in the project. They added stretch goals to improve the box set, some of which they reached and some that they didn’t. Before I participated, I only owned a single Kino Blu-Ray — Tarkovsky’s The Sacrifice. That’s not because I don’t appreciate their library. It is vast and extremely impressive. I just happen to buy a lot of Criterion, Twilight Time and other discs. I have to give a shout out to CriterionCast’s Off the Shelf for getting me to dive into deeper waters. I listen to their cast regularly, every Wednesday, the Newsstand once a month, and the others when I have seen the topics (maybe half the time). It was Brian from Rupert Pupkin Speaks and Ryan from CriterionCast that highlighted the value of the $500 package. Not only do you get the African-American set, but you get 25 discs from the Kino Library. If you do the math, that’s a pretty good deal for Kino discs PLUS it is major support for the project. A few contributions of that caliber could have pushed them through all of their stretch goals. Even though they fell short of the final goal, but I was still pleased with my contribution and disc selection. 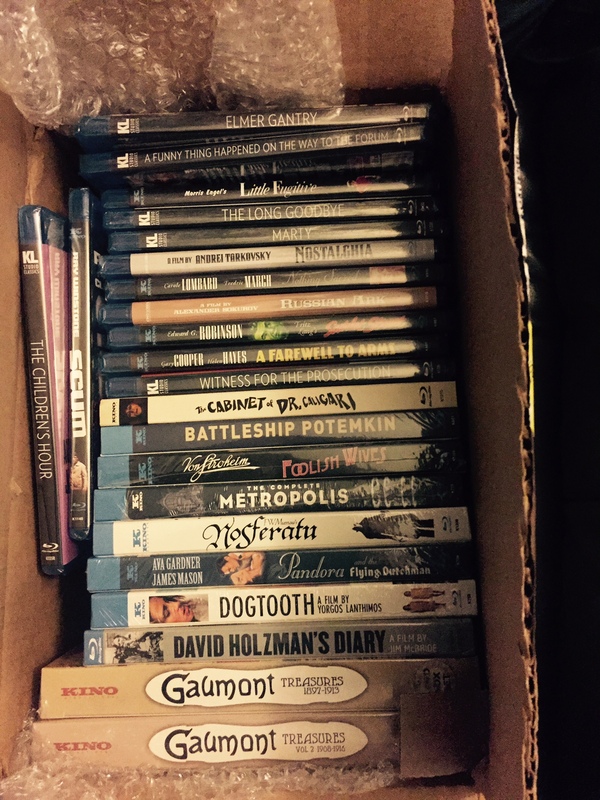 It was actually 23 discs because I chose both Gaumont Treasures sets, which count as two. Posted on April 13, 2015, in Blog. Bookmark the permalink. Leave a comment.